Hand Quilt Along Update – It's a T-Sweets day! Published on September 17, 2018 by Tracy @ It's a T-Sweets Day! Hello my friends! I am a bit late getting this update out, but better late than never, right? I wish I could say I had a lot more progress on my Salem Quilt Guild panel, but after my anniversary cruise, there just wasn’t a lot of time to spend embroidering. Last time I left off in the middle of the happy jack o lantern. And this time I have managed to get a few French knots and a bit of quilt outlining done. Not much, but a little is still progress in my book! BUT– I am happy to report that my backing fabric came in for my Down the Rabbit Hole Quilt, so I finally started to quilt it! YEA! It is going along way faster than I thought it would. I am using a loopy freestyle by hand,not computer stitch. It looks so very cute:)! It should be just a week or so more… maybe by the next HQAL report I will be able to have a final reveal and photo shoot. SWEET!!! Next Back To The Hook with Grinda! I love that backing fabric. Great choice. Any time you get your needle into the fabric, it is a step forward. I am having guilty feelings because I haven’t pulled out my quilt hoop for 2 months. Maybe when the weather cools off a bit. Keep posting so we can see how it goes. Oh my goodness Down the Rabbit Hole is so amazing! The backing is perfect! This is an amazing quilt and I can’t believe the progress too. Your doing awesome! Wow, what a great background fabric! Is it A Kaffe Fasset print? And, any stitch,is one less to do, I’m amazed you got any stitching done with the cruise! 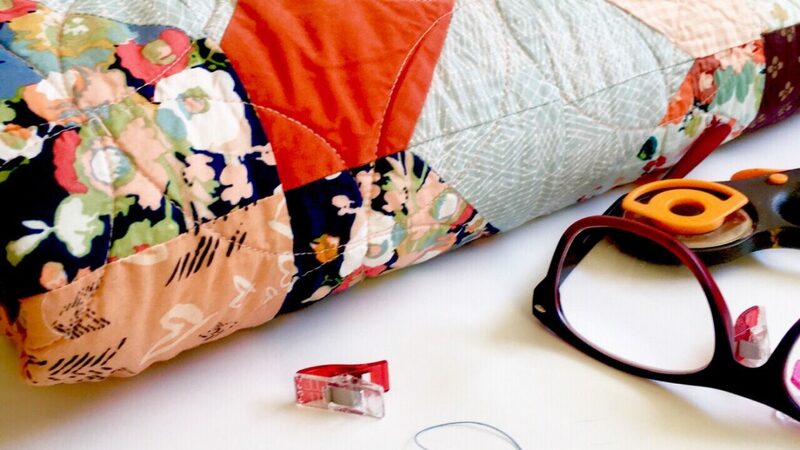 How do you choose your quilt patterns? The two you’ve featured here are wonderful! How amazing, to think you’re that close to being finished the Rabbit Hole quilt! You must want to work on it 24/7, to see it done! Love the backing, it’ll be amazing to finally finish it! Sarah Fielke is doing a talk about 30 miles from me, I’ve got a ticket! So excited!! Love the cheesy grin of the pumpkin! Your quilt is so cheerful 😍. If you posted late … I really commented late.. taking me a bit to visit everyone this time around. This is so bright and colorful! I admire your patience. Thank you so much! Yes, patience is defunct needed for his project. You have to enjoy the process or it is way too tedious to keep going until the end. Thank you for stopping by today!